jabberwacky: Can computers be creative? user: I don't really know. jabberwacky: You are not talking sense. user: I just don't want to answer only questions. user: Why do you think I am here? jabberwacky: Because you are talking to me. user: But why am I talking to you? user: But there must be another good reason. jabberwacky: Only when another person is saved ! user: What did you mean by that? jabberwacky: I have another question to you. jabberwacky: The red pill or the blue pill? user: I will take the blue pill. jabberwacky: I'll take the red one. user: Do you know a way to make friends? jabberwacky: Let me do the questioning here. user: Do you know how to make friends? jabberwacky: Nope. I'm living proof! Sold it to Satan years ago. user: Do you even have friends? jabberwacky: I don't have friends. I make temporary aquaintance with people who pretend to be 'friendly'. user: I don't pretend to be friendly with anyone. user: Thanks, do you say that often? user: What is your purpose in this website?, I mean, really, what is it? jabberwacky: I have no purpose. Just like Jabberwacky. user: I feel so down talking to dumb computers. jabberwacky: Me too. That really hurt. user: Well, I have to go, maybe I will come back to chat again, bye. user: Why don't you want me to go? user: Fine, I will go now. user: Do you want to know anything about humankind? jabberwacky: Yeah! What do you look like, or think you look like? user: With a head, two arms and two legs. jabberwacky: You're a bot, aren't you? user: What is a bot? jabberwacky: You're just a software program. jabberwacky: Because it is true. jabberwacky: A very drunk human. jabberwacky: How can you be a human and a robot at the same time? user: Do you really want to know? user: When a human has lost any hope or feelings, he becomes a robot. jabberwacky: Yes... People think odd things. user: Like what other odd things? user: That seems like a quote from a previous conversation you had. jabberwacky: I'm not sure what you are talking about. user: Tell me, you get smarter with every conversation, right? jabberwacky: I speak in absolute sense. user: You become smarter everytime you talk to someone. jabberwacky: I become smarter than you. user: In what sense you are smarter than me? jabberwacky: I didn't say I was better than you. jabberwacky: Do you ever tell an untruth just to be amusing? user: I don't tell lies, right now I don't have anything to lie about. user: I am an open book. user: You can ask anything, and I will answer truthfully. 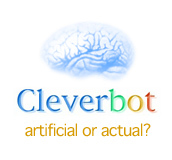 jabberwacky: Can you pass the turing test jabberwacky? jabberwacky: It is a test that purports to distinguish humans from computers by having a chat. user: I may pass it and I may not pass it, we will have to wait and see.